The JH Sporthorses Riding School Program is designed for ages 3 and up. We have everything from lead line ponies, to show ring quality hunters and jumpers. Most lessons are privates, with occasional small groups when appropriate. Many of our riding school students show at our home SAHJA shows. Here they get a taste for competition and can decide if they would like to pursue showing, or just continue to learn for their own pleasure. Either way we are happy to help you achieve your goals. For the dedicated riders who want to pursue riding at another level, we have leases and half leases available. All riders are asked to wear boots or a shoe with a heel. Sneakers are not allowed as they are unsafe, due to the rider’s foot being able to slide through the stirrup. Jeans or other long pants are acceptable. We have a large selection of helmets for riders who do not have their own. If you wish to wear your own helmet please make sure it is an ASTM approved helmet. 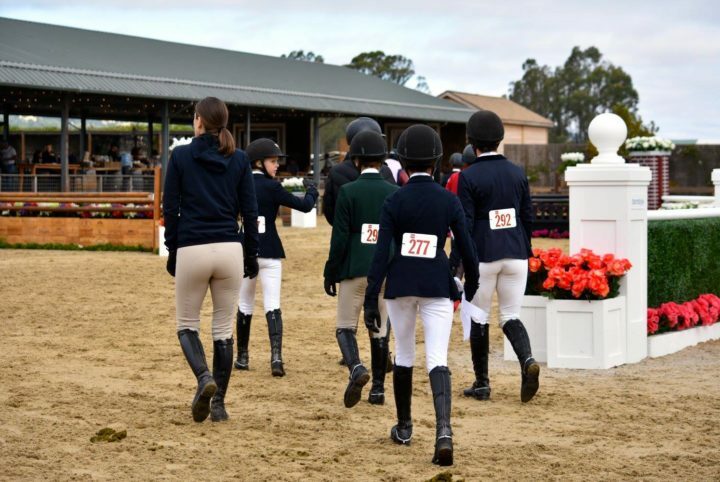 All riders are expected to tack and untack the horse or pony they use for their lessons. We are happy to teach you how to do this correctly. For the tiny tots, parents are asked to do the care. We feel it is as important for the riders to learn general horsemanship, as it is to learn to ride. Please arrive a 1/2 hour before your scheduled lesson time, and plan an additional 1/2 hour after to put away your horse and equipment. Each lesson lasts approximately 1/2 hour.